AWARD-winning actor and director he may be, but things haven’t come easily for Barrie Rutter. Once named Creative Briton of the Year; recipient of the OBE in 2015; and lauded for his promotion of Shakespeare in the regions, the Hull-born thespian is a shining example of theatrical success. The company started in a subterranean viaduct beneath a cotton mill in Halifax, and early performances were staged in boat sheds, museums and castles. But Barrie’s idea of ‘northern voices, doing classical work in non-velvet spaces’ soon carried it from strength to strength; nowadays Northern Broadsides gets invited to top theatres around the world. “It just took off,” he recalls. “It’s something that hadn’t been done before and something clicked with reviewers and audiences, and colleagues said we could do this again.” Barrie doesn’t claim his Yorkshire accent ever held him back but admits his attitude was shaped by poet Tony Harrison’s rage against high culture. 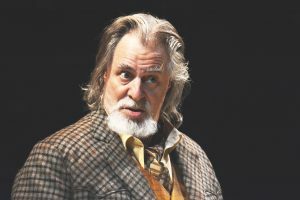 Northern Broadsides will be bringing its brand of culture to Surrey next week in the form of William Shakespeare’s The Merry Wives of Windsor, with Barrie in the lead role of Sir John Falstaff. Merry Wives sees vain rogue Falstaff’s rather clumsy attempts to seduce a couple of well-to-do wives… but Mistress Page and Mistress Ford get wise to his plan and scheme to exact their revenge with unimaginable consequences. “It’s a lovely part,” enthuses Barrie. “It suits me to play it. I’ve always had a sort of joy at playing these big character roles, I love the rock and roll lines. Northern Broadsides have set the play in the 1920s, but Barrie, who also directs, says the date is not that important. “People always say ‘When is it set?’, as if that’s vitally important,” questions Barrie “It’s traditionally set in the 15th century but we can’t afford that many staff to look after the costumes so we’ve moved it to the 1920s, which is fine! He’s also fairly sanguine about his lack of screen acting – he did appear in ITV’s Fat Friends and the film version of Porridge. Northern Broadsides will bring The Merry Wives of Windsor to Guildford’s Yvonne Arnaud Theatre from Tuesday (10 May) until Saturday 14 May.